CT1302-1 is a Chrome Oxide Silica coating applied using the Plasma process. 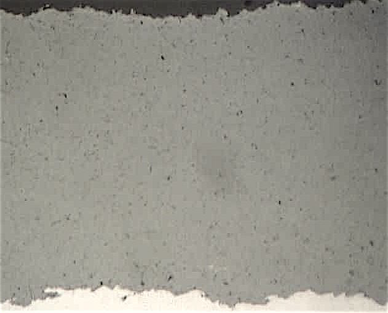 The coating is typically applied over a corrosion resistant bond layer. Coatings of CT1302-1 are dense, well bonded and very resistant to wear by abrasion. They are also among the most impact resistant of ceramic coatings provided that care is taken to select a sufficiently hard substrate to avoid the collapse of the metal under the coating. CT1302-1 is used for severe service conditions of abrasive wear. Coatings of CT1302-1 are among the most robust ceramic coatings known in terms of overall wear resistance. They are very resistant to chemical corrosion, abrasive grains, hard surfaces, particle erosion and cavitation. The coatings may be used up to 1000° F. and are insoluble in acids, alkalis and alcohols. Use for pump impellers, mechanical seals, paper industry applications combating abrasion, and plastic mixing apparatus where long term resistance to abrasion is paramount. These coatings also have excellent self-mating and anti-galling properties. Finish CT1302-1 by diamond grinding. This coating may also be superfinished to a very fine 5 Ra finish.